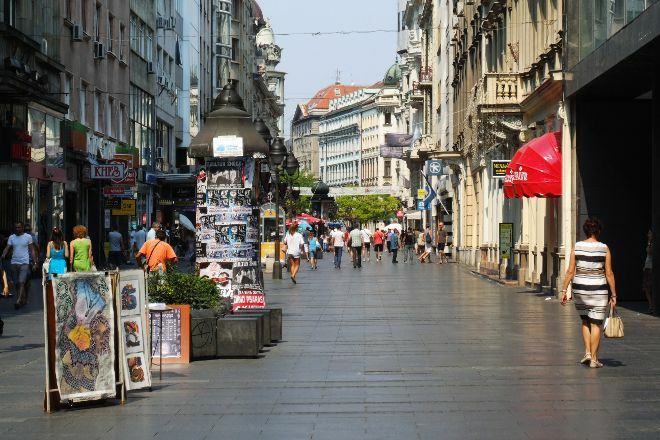 Knez Mihailova, the city's main pedestrian zone and one of the favorite meeting points, features shops, restaurants, and mansions from the 19th century. Stretching between two important areas, Terazije and Kalemegdan, this street has a lively atmosphere at most times of the day or night. Find anything from contemporary cafes and brand name boutiques to important cultural venues, such as the Serbian Academy of Sciences and Arts. Grab an ice cream and have a leisurely walk, stop in one of the free galleries, and snap photos of the architecture and street artists. If you're hungry, choose from Serbian or international restaurants. In addition, the street hosts a large number of souvenir shops and stands that sell postcards, arts and crafts, and memorabilia. Arrange to visit Knez Mihailova and other attractions in Belgrade using our Belgrade road trip planning app . Many old buildings. At the beginning and end of the road many cafes and restaurants. The street leads to the fortress. Every day, we help thousands of travelers plan great vacations. Here are some tips on how to use your Listing Page to attract more travelers to your business - Knez Mihailova. Promote your permanent link - https://www.inspirock.com/serbia/belgrade/knez-mihailova-a320913757 - on your website, your blog, and social media. When a traveler builds a plan from this page, the itinerary automatically includes Knez Mihailova. This is a great way for travelers looking for a great vacation in your city or country to also experience Knez Mihailova. Promoting your link also lets your audience know that you are featured on a rapidly growing travel site. In addition, the more this page is used, the more we will promote Knez Mihailova to other Inspirock users. For best results, use the customized Trip Planning Widget for Knez Mihailova on your website. It has all the advantages mentioned above, plus users to your site can conveniently access it directly on your site. Visitors to your site will appreciate you offering them help with planning their vacation. Setting this up takes just a few minutes - Click here for instructions.